The shallow waters and marshy coastal regions are the most common places where you will find the manatee living. They are known to be living in small rivers, the Amazon Basin, West Africa, the Gulf of Mexico, and the Caribbean Sea. Where you will find them depends on the time of year, water temperature, and the specific species. There are areas where you will find large numbers of them congregating. These are usually very close to the shore. As a result, there are often humans that want to be in contact with them. It isn’t a good idea to touch them though due to the fact that they are very vulnerable to a variety of diseases that they can easily spread throughout the habitat to other manatees. They tend to live in bodies of water that are warm, at least 65 degrees Fahrenheit. During the winter, they tend to move to the warmer river areas. They do have a very wide range and it varies based on the time of year. The West Indian manatee have been seen around the coast of Georgia in the United States. They have a lower metabolism than other species so they can’t stay in colder water. The manatees that live around the Florida area are able to move into various areas based on their needs and water temperature. They have been located in the far North region of Cape Cod during the late summer months. 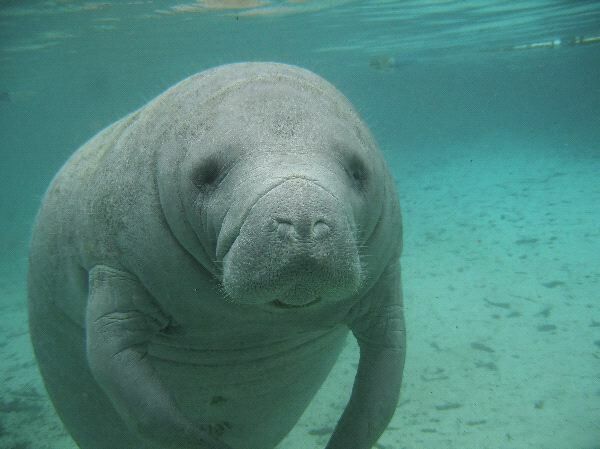 Migrating to Florida is very common for the West Indian manatee. Approximately 400 of them are found annually in the Citrus County river area of Florida. This is a prime attraction for tourists during that part of the year. Artificially warmed areas such as those from the power plants of Florida also offer a haven for them in the winter time. In fact, there are concerns from conservation groups that the manatee is too dependent on them. They used to migrate South but now they are going to these man-made heat sources. During the dry season, some of the rivers where the manatee live can start to dry up and not have enough water for them. When that occurs, they will start to migrate downstream and end up in various lakes or they will go to deeper parts of the river. Some of the manatee are known to migrate over 2,000 miles in a season in order to have their needs met. Over time, the distribution area for the manatee has started to dwindle. This is due to humans coming into those natural elements and taking over. In some locations, the high volume of boating activity has created too much stress for the manatees. As a result, they aren’t returning to those areas. Problems with pollution have also pushed them into new environments where they can find food and where they are able to survive. With the decrease in numbers, there are concerns about the manatee and future survival. A big part of the conservation efforts involve protecting their habitat and helping them to be better distributed. Some of the projects in place involve attempts to re-introduce the manatee to locations where they once lived but either haven’t for a while or the numbers have been very low. Extensive studies have to be conducted on such environments though to ensure they have the highest possible chance of thriving there. Sea World in both California and Florida offer a safe haven for some manatee that have been injured or can’t survive in the wild for one reason or another. These programs do show that they do well in captivity. It has also offered a good research location for finding out more about the behaviors of the manatee.